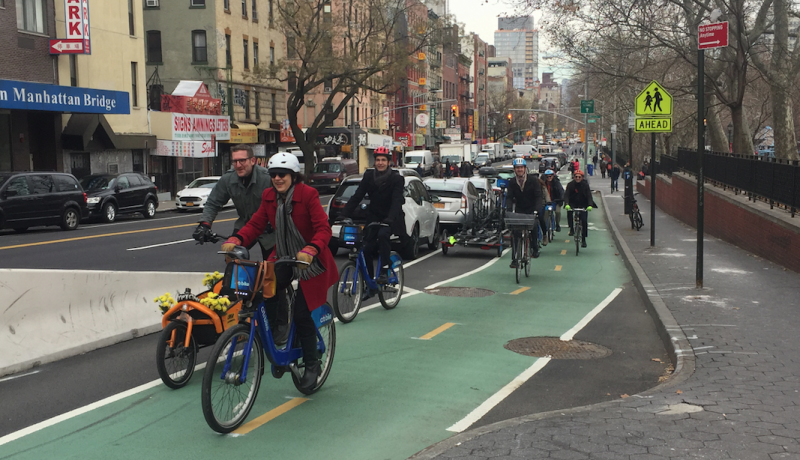 The two-way protected bike lane on Chrystie Street is one of the most anticipated bike network improvements of the year, creating a much safer connection to and from the Manhattan side of the Manhattan Bridge [PDF]. Today, DOT officials and State Senator Dan Squadron joined advocates for an inaugural ride on the redesigned street. The Chrystie Street redesign, which links the bridge to Houston Street, is one of several recent DOT projects that have yielded more cohesive protected bikeways on the East Side of Manhattan. Thanks to the Chrystie overhaul and new protected bike lanes on Jay Street, First Avenue and Second Avenue, and around the Willis Avenue Bridge, gaps on those East Side routes are much smaller at the end of 2016 than they were at the beginning. 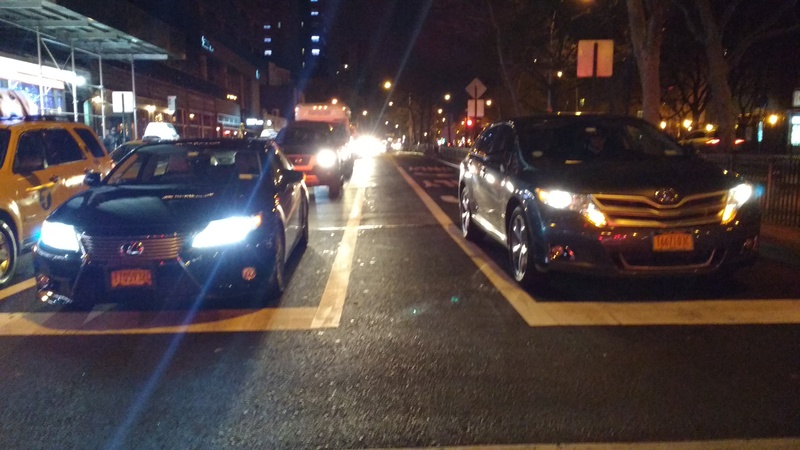 The old, unprotected bike lanes on Chrystie Street were frequently obstructed by illegally parked cars, trucks, and buses. 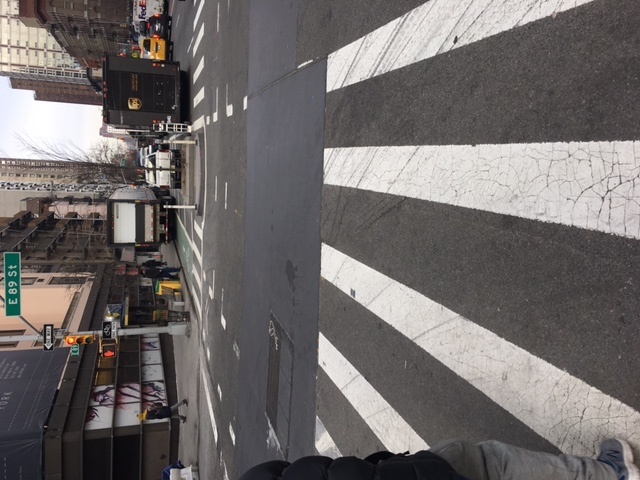 Early in 2015, Transportation Alternatives Brooklyn activist Dave “Paco” Abraham presented a proposal to upgrade Chrystie Street with a two-way protected bike lane. The concept quickly earned the support of Squadron and other local elected officials, as well as Manhattan Community Board 3. This year DOT made impressive strides on the bike network. Taking stock of that progress, Trottenberg said the 18 miles of protected bike lanes installed in 2016 were a record for the agency. Other marquee projects included protected bike lanes on Queens Boulevard in Elmhurst and Amsterdam Avenue on the Upper West Side. DOT Commissioner Polly Trottenberg leads the pack on the Chrystie Street inaugural ride. Aside from days when I stop at the Union Square farmer’s market, I’ve re-routed my ride home to take advantage of this. It was south on 5th Avenue and Broadway, and over on Grand Street. It is south on 5th Avenue to 40th, over to Lexington Avenue, south of the Queens-Midtown tunnel, and then over to Second Avenue for the ride south on Second/Christie. 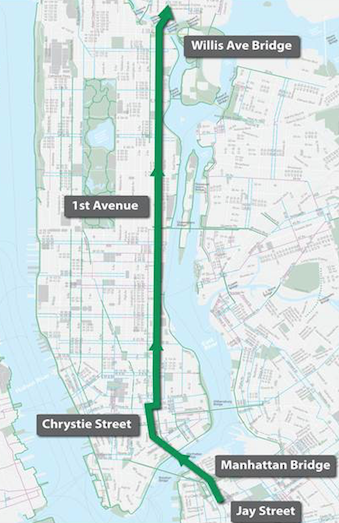 Does anyone know what the timeline is for 2nd Ave from 59th to 43rd St? Or 1st Ave between 47th and 48th? I’m hopeful about this 9 mile protected First Ave corridor, but then I ran into it blocked this afternoon (see photo of wall o’ trucks). And on the block south of this wall o’ trucks, a construction crew had blocked the lane. Of course they could have used their plastic jersey barriers to shift the bike lane into the parking lane or motorist lane and maintained the protected corridor, but they decided that these were more important than cyclists’ safety https://uploads.disquscdn.com/images/ce57f0b97828594cb03edd34b62f68cc35817105fde5fabec267e37c3c7c32ca.jpg . So only the bike lane was blocked during construction. Or Allen just south of Houston and through the intersection into 1st Ave. I think the whole thing is considered done and will probably be a solid green line on the map next year. I was on Allen/1st this morning. Seems done to me. Also looks good on Google Maps / Street View too (dated Sept. 2016). I rode the not quite completed lane southbound a couple of times. Even after dark on a cold night in the dead of winter, there were like eight bikes waiting to cross Houston, so I can only imagine what it’ll look like in the summer. There are a couple of new driver induced pinch points however. At Delancey, drivers of course insisted on pushing through the yellow when traffic is clearly going nowhere, and blocked the crosswalk and bike lane. I crossed with the green light, and some SUV insisted on pushing through, honking all the way. At Grand, the lane was also blocked by backed up right turning cars, while the light was green. Ah, I see what you mean. Sorry about that.